1.The First Episode. Hello World, bootstrap your first app. The most fascinating in being a programmer is that you can create stunning things. And the best about being a Ruby programmer is that you can create them so easy. Just take a look at basecamp.com, twitter, github, hulu or shopify. Those are all great products, that were (well, at least initially) created in Ruby. The awesome screencast How to build a blog engine in 15 minutes with Ruby on Rails made by DHH (and the power of used TextMate) was probably my initial point of interest. It started the fire, that made us switch from Pylons (Pyramid framework now) and Django (which is also nice, btw) to Ruby on Rails. Learning curve was absolutely great, simple as that, out of nowhere we started to have some time to work on our own tools (none of which was ever shown to the public, to be fair) and started our interest in the SaaS market. Because how many Social Media apps one can build?? My dream from the point when I started my adventure with Rails, was to create something like Basecamp, but somehow different. I loved the product, but I was missing some features here and there. It just wasn’t working for our scenario, or maybe it’s just me who couldn’t be flexible enough. Anyway - by creating this “course” we’ve decided, that something like basecamp clone would be a great introduction (and I’m using its name just to give you a general idea of the product we plan to build here). An introduction to all kinds of not-so-experienced Rails programmers who would like to get familiar with the technology itself. So, what’s exactly all the fuss about SaaS? Software as a Service (SaaS) is a web-based cloud service that offers remote access to the software (a program or an application). All you need is an electronic device with an Internet connection. To be more specific it is a box version of ready-to-use product. A package of services that creates a running application. The difference between the traditional approach to the software management and SaaS is that the code, database and servers are maintained by the SaaS vendors. In other words, SaaS is a box version of the product combined with the back-end requirements. We got quite a big feedback from you when we introduced this course. At first it was meant to be a series of rather short blog posts describing how we do SaaS apps. With the feedback we received, we feel that majority of users who signed up to our newsletter are more beginners, than advanced Ruby/Rails coders. Remembering our own beginnings and knowing current Rails learning curve, we’ve decided, that this course will be dedicated to the first group. Nonetheless, if you’re a more advanced coder, you (hopefully) will still find some useful info here. Do you think that Ruby on Rails is the only framework of choice for building SaaS applications? No, of course not. We just know Rails quite well and it just works for us. If you plan to build your own SaaS application and you already know PHP/Python/whatever, do not learn Rails just for it - use your current knowledge. Is your way the only “correct” way? No, not at all. This course will be opinionated, it will use some of our proven practices, that turned out to work pretty well during the few last years of gaining experience. We absolutely don’t want to walk in the shoes of the-only-blessed-and-knowing. What we want is just to share our knowledge, show you how we do some things. And have a little fun, of course. We’re going to introduce course content (as we already did) and start making basic app. We’ll begin with a simple account creation and making subdomains work. With the new account, we’re going to create admin profile that lets to invite new users. Newly invited users should be able to register themselves, but to make an account slightly more secure, individual token should be validated. We should be able to see when an invitation was sent and when it was used (or in other words - when an invited user is registered). If the user already has an account, he should be prompted for his credentials and added as a new member to given account. Starting a real multi-tenant app: projects, permissions, to do lists and items. Data from one account should not, by any means, be visible to members of another accounts. Fortunately, there’s a gem for that. We will let our users create projects, assign permissions to them and probably create a to-do lists and to-do items. We’ll create a timeline - a brief summary of what was happening lately. We’ll also allow users to receive one notification every night. We’ll create an API for above features, to let manage their data ie. using console. We'll try to implement payment support as well, probably without subscriptions though. The idea of this course is to show you how things can be made. And once more - this is opinionated, etc. Remember, we’ll be happy to help you, answer your questions, and so on. However, at the same time, we’d like you to be able to solve your issues with ruby/rails/etc installations or anything similar, by your own. This is how the commands should look typed in a console. Every command starts with the ‘$’ - console greeting symbol, not a part of our code. We’re going to present you commands with stripped-down, simplified output. Just to show only the most important aspects. Until stated differently all command blocks assume that they run from the app root directory. Ok, let’s get this baby rolling. Let’s create a new app. We’re gonna call it getwolfpack (but you can call it whatever you like, it’s really not that important) and use PostgreSQL as a database engine. Because of a few reasons: it’s one of the most powerful db engines out there, it’s fast, it scales well, it will be probably used in production environment (for sure on heroku.com). Plus, we’re going to use some of its more advanced features later on. I also believe that you should be developing in an environment the most similar to the production - this really saves a lot of time and spares troubles that could occur later. Of course - we could use a virtualized environment via vagrant or docker, but this would be overcomplicating things for our needs here. Open your terminal and run following command. It will create app for you, copy all required files, run bundle install after completing. Additional parameter -d informs this generator, that it should use PostgreSQL as database. If you want to learn more about this commant, run rails new -h.
database.yml file defines connections to db - it tells Rails how to connect to database. By default databases are named after environments in which application is run. So if you're running your app in development environment (default when writing the app), Rails will make use of development config. When you'll be writing tests, test environment will be used. You can read more about it here. Normally we use HAML to structure HTML content. Of course, there are other choices, equally good, we just got used to HAML. Why not erb? It simple - HAML enforces cleaner markup via proper indentation. In our opinion, it’s more readable. This could be done with one command: 'rake haml:erb2haml'. It changes all your .erb views into .haml and in some scenarios this may be harmful. I belive, that it's good to know your toolset, but sometimes doing something by hand and explicite is a better way - leaves you more control. Once we’ve made changes to the markup used by the app, let’s add Bootstrap as well. We use bootstrap because of its well known opinionated structure, that helps making responsive apps really fast. It also provides some elements, that we might be using later. To add Bootstrap libraries to our app we could do one of following - use gem or link to it directly. We will add bootstrap-sass gem to Gemfile. We could add direct links i.e. to bootstrap CDN, but by embedding it via gem we’re sure that all required libraries will be available for offline development. Before making final deploy to production, it may be worth to remove it from gemfile and link from CDN though - in this way the website will load slightly faster. Now, rename app/assets/stylesheets/applications.css to app/assets/stylesheets/application.css.scss - by doing so you let Rails to know, that it should parse this file using SCSS parser. This rails generator will create a controller file, view directory with index.html.haml in it, add it to routes and generate simple test for it. Let’s make it default route. also from application.js remove last //=require_tree . and as with application.js - remove *= require_tree . As an explanation - we don’t want every script to be loaded automatically - this can lead to serious and hard to debug mess in assets. By moving controller specific files to subdirectories and requiring only this subdirectory we keep some control while still having asset loading automated. Finished in 6.489450s, 0.1541 runs/s, 0.1541 assertions/s. Current WelcomeController is auto-generated and checks only two things: if actions end with success response and if template for this action is generated properly. As we haven’t made any additional changes here, everything should pass as we expected. We’ll leave it as for now. Ok, it would be good to finally add our code to code repository. We’ll use git. Before adding new files, edit .gitignore file and add /config/database.yml to it - we don’t want our database config to be added to the repository. Sometimes, to speed up things a little, we copy config files (database.yml in this example) file to FILE_NAME.sample. Ok, it’s time for account model. Account will be an object representing something like organization / company. Identified by it's own subdomain it will group all data belonging to one organization. Ie. by accessing prograils.getwolfpack.com you should be able to access account of organization 'prograils'. As for now it should have only its own name and subdomain. Before running migration it would be a good idea to modify it a little and add a unique index for the subdomain - as an additional check, to make sure that no one will ever register a second account with the same subdomain as already existing one. Migrations are instructions for Rails how to perform changes to database. They are always run in alphabetic orders. When generated, migrations are "timestamped" - they always start with current timestamp, so in order to find last created, just open last file in db/migrate/ directory. \A means beginning of the string (not the line! ), \Z indicates the end of the string (once again, not the line!). This is often forgotten and skipping it may lead to security issues in some cases. To get familiar with regular expressions in Ruby, try out Rubylar - it's awesome expression tester. We’re going to check if we meet above requirements by writing some tests. But before doing so, we’ll add FactoryGirl for generating test data - build-in fixtures are not our favorites. So in Gemfile add factory_girl_rails in development and test group. We’re adding it to development group as well, because we want factories to be generated automatically when we generate models. Please, notice the last line of output. Before moving forward, let’s add minitest-rails and minitest-spec-rails gems to Gemfile to have a nice minitest support for Rails and use spec-like format. Finished in 0.090845s, 11.0077 runs/s, 0.0000 assertions/s. Finished in 0.531356s, 7.5279 runs/s, 22.5837 assertions/s. $ git commit -am "added account model"
Now modify user migration to add two additional fields: first_name and last_name. We tend to add such modification on top of devise migration - thanks to it, it’s more readable, plus when you operate on raw sql data those custom columns are displayed as first. Before migrating let’s add additional model - Membership. This model will be used to tell us if the user has access to the account. Right now tests won’t pass, as there are some issues with factories. Let’s fix them. Remember about moving controller-specific assets to controller directory. I will also remove accounts_helper.rb as it won’t be needed at this point. What happens now is that we’d like you to create an account with you as an owner assigned to it. We assume, that when the new account is created, the owner is automatically asked to provide his credentials so he could log in and manage this account at once. We want to create account together with its owner - that is - we assume for now, that when user (site visitor) is creating new account, he should provide his credentials as well. To make is possible, we will accept nested attributes for owner - specific relation, that we have to add (Owner is user, who belongs to account with membership role == ‘owner’). First, we create relation to one owner membership that account can have. Then we create relation to User model via owner_membership. On the other hand user will have many owner_accounts records - it’s the account that has only one owner. Before anything we should add account to config/routes.rb. We specify singular resource because we won’t be listing account. We also limit actions only to new and create - we don’t need more actions right now. It's better to practice limiting something explicitly earlier, that to leave it for undefined future and, as a result, forget about it. Normally, with direct has_one relation you should be able to do something like @account.build_owner instead of above construction, but as this relation is “tricky”, we have to use a workaround. Also , take a look at welcome/index.html.haml - let’s finally change a default text and add link to the new account form. Classes btn btn-success are provided by bootstrap and will make our link look slightly nicer. @account = Account.new(account_params) # 1. @account.owner = User.new(user_params) # 2. Normally we should create only account and accept resources for its owner (if the owner belongs directly to the account) in account_params. In our situation (with has_one :owner relation via :owner_membership) we have to deal with that differently. So, first (1.) we're initializing account from params, then (2.) we're initializing it's owner. Only single save(3.) call is required to perform all validations - Rails are clever enough to check owner (User) model as well. Also (4.) - in user_params method we require params to have the owner - so it’s not possible to have an account created without the owner. We have defined accepts_nested_attributes_for :owner method in model - thanks to that Rails will perform validations on owner as well. Let’s test it (accounts_controller_test.rb). Before making new account let’s build hash of attributes, that will be sent in form. let is just more readable in tests in our opinion. Now we can create new accounts. It would be great if their owner could also sign in to new account. All important actions are going to happen in accounts dashboard - there in the future we will be displaying timeline with recent activity. Let’s create a controller for it. Accessing it will require user to be authenticated. As previously, remember about moving controller-specific assets. You may also remove generated helper file (rm app/helpers/dashboards_helper.rb). and create view file (app/views/dashboard/show.html.haml). Add whatever you want to it. before_action method is fired on every request before getting into action methods. If method called will return any type of response methods (ie. redirect_to), the whole chain will be stoped and response will be sent to user. :authenticate_user! is method provided by devise which checks if user is signed in and if not - it redirects user to sign in form. After applying above change, when you will try to show this view again, you will be redirected to sign in form. When you take a closer look at sign in form, you’ll notice, that a user is able to sign up as well. This is not expected behavior right now (as user would sign up to the system, but wouldn’t have an account assigned to it). Let’s block it for now. To do so in User model remove :registerable from devise method call. Voila, magic happens. 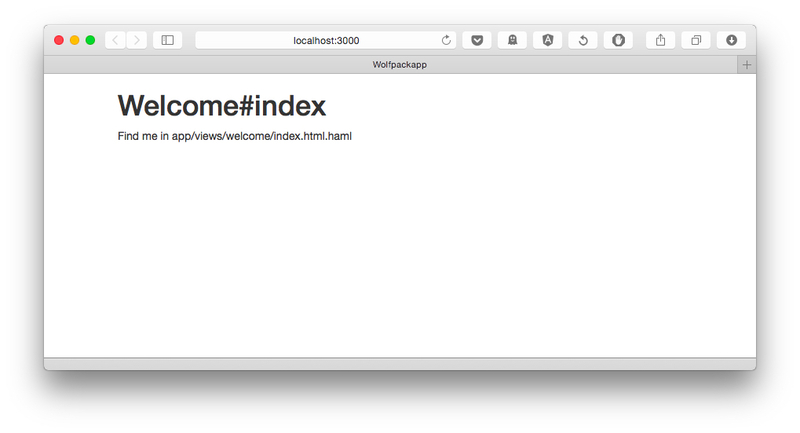 Now accessing localhost:3000/dashboard shouldn’t work anymore. Small hint here. As you probably see, anything.localhost:3000 won’t work. You can use one of domains, that is resolving always to localhost, like lvh.me, or wait for it... prograils.io ;) So visiting prograils.io:3000 should call your welcome controller, while anything.prograils.io:3000 should give you login form. Try that. return unless user_signed_in? # 2. It runs redirect_to_subdomain method on every request. It skips further checking if user is not signed in. Otherwise it checks, if subdomain exists. If not, user is redirected to root_url of his first account. If subdomain exists, system checks if it belongs to the account of which user is a member. If not, he’s redirected to his account. That should be it. Now we should check if the system behaves properly if a user is signed in and trying to access his account. He should see show action of DashboardController. Finished in 4.036164s, 2.7254 runs/s, 6.6895 assertions/s. Regarding tests and order of writing them - we know, that this is not fully TDD. But full TDD is hard to achieve, sometimes is counter-productive and hard to make in this course. Our main idea is not to teach you how to do tests, you can find plenty of them in the Internet. We belive that this simplification is ok enough to be continued in the next part, while it still puts some impact on testing and shows where they are important. Generally, you should write tests before writing the code, that proves they are ok. Generally. P.S. Do not forget to add all files to Git and then commit them. If you have problems, we have published app in the same state on github - this links to tagged commit and should contain more or less same code, as presented in this chapter.